Where home is not a place... it's people. From its historical roots to modern day amenities, the Clinton area offers something for everyone… year-round recreation at Clinton Lake State Recreation Area and Weldon Springs State Park, quality schools, shopping, and friendly neighbors. Clinton is a great place to live and do business, for a weekend or for a lifetime! 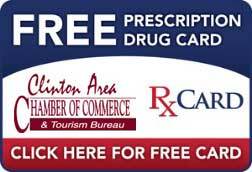 Chamber Members please contact the Clinton Area Chamber to post your job openings.